Fire fighting foam is a collection of bubbles formed by the aeration of a solution of foam concentrate with water. Foam is made up of three components – foam concentrate (a liquid produced by chemical manufacturers and supplied in drums or bulk) water and air. The finished product, foam, floats on a fuel surface to extinguish a flammable liquid fire by separating the fuel from oxygen. Because of its high water content it also helps cool the fuel surface and any hot objects in the fire area. Foam expansion is classified into three headings – Low, Medium and High. Expansion is defined as the ratio of the volume of foam produced to the volume of foam solution required to make it. Expansion ratios up to 20:1 are usually considered to be low expansion foams; 20:1 – 200:1 medium, and above 200:1 high. Each expansion ratio has different uses. A well formulated foam applied correctly will exhibit a range of properties including stability, cohesion, rapid fire knockdown, heat resistance and vapour suppression that will ensure that a fire is extinguished efficiently and securely so that re ignition does not occur. Foam concentrates are available from a number of manufacturers within the Tyco Group including an extensive line of ANSUL® premium foam concentrates for both Class A and B fires. We can also supply foam concentrates from the Towalex and Sabo range. The product range includes Protein, Flouroprotein, and AFFF foams suitable for most types of flammable liquids including Polar Solvents. Foam concentrates are available in 1%, 3% or 6% concentrations. We can also provide foam for vapour suppression / neutralising and where require we can provide training foam. Product Datasheets and Material Safety Data Sheets are available for all foam agents – see the links on each product page. There are numerous types of foams that are selected for specific applications according to their properties and performance. Some foams are thick, viscous, and form tough, heat-resistant blankets over burning liquid surfaces; other foams are thinner and spread more rapidly. Some foams are capable of producing a vapour sealing film of surface active water solution on a liquid surface. Others, such as medium and high expansion foams, are used as large volumes to flood surfaces and fill cavities. Foams have been classified in different ways over the years. The earliest foams were based upon a chemical reaction occurring between aluminium sulphate (Al2 (SO4)3) and sodium bicarbonate (NaHCO3). The energy used to create the foam bubbles came from the chemical reaction. This type of foam is now largely obsolete. Mechanical foam is produced by mixing a foam concentrate with water at the appropriate concentration, and then aerating and agitating the solution to form a bubble structure. Therefore, unlike chemical foams, the energy used to create the foam bubbles of a mechanical foam comes from an outside source. There are several types of mechanical foams: – Protein – Fluoroprotein – Film-Forming Fluoroprotein (FFFP) – Aqueous Film-Forming Foam (AFFF) – Alcohol-Resistant Concentrate (ARC) – Synthetic Detergent (High/Medium Expansion) The differences between these foam concentrates depend on: – whether the concentrate is based upon naturally occurring materials or synthetic chemicals. – whether the synthetic chemicals are fluorinated or nonfluoronated. – the type of fuel being protected. – the expansion ratio. – whether they will form an aqueous film on certain fuels. Protein Foam is derived from naturally-occurring sources of protein such as hoof and horn meal or feather meal. The protein meal is hydrolyzed in the presence of lime and converted to a protein hydrolysate which is neutralized and to which other components are added such as foam stabilizers, corrosion inhibitors, antimicrobial agents, and freezing point depressants. Foams derived from protein foam concentrates generally have very good heat stability and resist burnback, but are not as mobile or fluid on the fuel surface as other types of low expansion foams. Protein foams are susceptible to fuel pickup; consequently, care should be taken to minimize submergence. Fluoroprotein Foam is derived from protein foam concentrates to which small amounts of fluorochemical surfactants are added. The fluorochemical surfactants are similar to those developed for AFFF foam agents but used in much lower concentrations. The addition of these chemicals produces an easier flowing foam. Because of these chemicals, fluoroprotein foams are said to be oleophobic (oil shedding) and are well suited for sub-surface injection. Aqueous Film-Forming Foam (AFFF) is a completely synthetic foam. It consists of combinations of fluorochemical and hydrocarbon surfactants combined with high boiling point solvents and water. Surfactants are chemicals that have the ability to alter the surface properties of water. Fluorochemical surfactants alter these properties in such a way that a thin film (Figure 1-7) can spread on a hydrocarbon fuel (such as gasoline) even though the aqueous film is more dense than the fuel. Film-Forming Fluoroprotein (FFFP) is a protein base foam concentrate to which quantities of fluorochemical surfactants (similar to those used in AFFF foam agents) are added. This improves the mobility of the foam to the point where it begins to approach the quick extinguishment that is characteristic of AFFF foam agents. On some fuels, it also forms an aqueous film like the AFFF foam agents. However, this reduces the burnback resistance that is characteristic of protein-based foams. Film-forming fluoroprotein foams tend to be a compromise between AFFF and fluoroprotein foam agents. Synthetic Detergent type foam agents are based on mixtures of non-fluorochemical, hydrocarbon type surfactants along with solvents and water. These foam agents do not form aqueous films or polymeric membranes. Instead, they function by forming an aggregate of foam bubbles on the surface of the fuel. They are used most frequently with high expansion foam generators yielding expansion ratios of 200 to 1000:1 (see Figure 1-9). The reduced water content of high expansion foams makes them suitable for use in total flooding applications and on cryogenic type fuels such as liquefied natural gas (LNG). Some of these foam agents are specially formulated to be used with low, medium, and high expansion foam hardware at different proportioning ratios and are referred to as multiple expansion foam agents. Alcohol-Resistant Concentrate (ARC) produces a foam that is effective on fuels such as methyl alcohol, ethyl alcohol, and acetone which have appreciable water solubility or miscibility. Standard foam agents are mixtures of chemicals (natural or synthetic) whose bubbles collapse when applied to water soluble fuels. These fuels are said to be foam destructive. The early alcohol-resistant foams were based on mixtures of protein foams and chemicals called metal soaps. These chemicals are hydrophobic or water repellent. The most current alcohol-resistant concentrates are based on AFFF concentrates to which a water soluble polymer (polysaccharide) has been added. 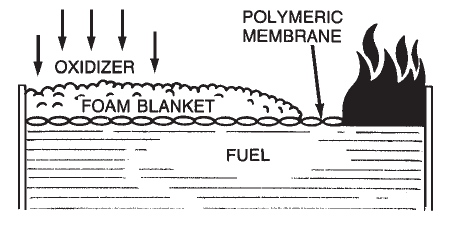 When these foam agents are applied to a water soluble fuel such as methyl alcohol, a polymeric membrane (Figure 1-8) is formed between the foam and the water soluble fuel. When this foam agent is used on a conventional (water insoluble) hydrocarbon fuel, it functions as an AFFF foam by forming an aqueous film at the fuel/air interface. Since the polymer is a naturally occurring chemical, small amounts of an antimicrobial agent are added to prevent biological degradation. Specialist foams for toxic vapour suppression of fuels and other chemicals are now available. Such foams often require resistance to chemical reaction. Usually they are applied at medium expansions to form a long lasting and deep blanket of foam on the chemical surface.